Today is very special day. Rare, because it only happens every four years. I wonder about the people born on Feb 29, do they celebrate every year on the 28th then one humongous party every four? Or they only celebrate every four? Men, those kids would have been really miserable getting presents so long apart! Anyway, I did not want to let this day pass us by without even stopping for a second to reflex on how unusual it is. Yes, I know I should be glad to receive good news. And I am, just this week I got my first review for Love Me Two Times, but also a new release: The Outpost. I’m also gearing up for the release party, so no problems there. However, when I was driving my kids to school this morning, my car started making some funny noises, especially when I was turning. Then the steering wheels started to shake wildly, like when you have a bump on a tire. I stopped, kneeled to see something, don’t know exactly what I was looking for since my knowledge in mechanics is limited to make sure the car has gas and oil (;-) ). So obviously, I didn’t see anything. I got back in the car, finally arrived to the school and when the kids got out and I accelerated, nothing happened! Well, not exactly nothing, I felt and heard a noise coming from underneath the car. Although I don’t have my mechanic on “speed dial” he is on my cel’s phonebook. He said told me to leave the key with somebody at the school and he’s come to tow it later in the morning. Already alerted the mrs. As she would have to pick up Daniel and Sebastian after school, also alerted the loan officer for some fast cash because only God knows how much is this going to cost me! Lol. My short sci-fi story that I was refering to a couple of posts back has been released today! Murphy's Law, is there anything else that can go wrong? Karl Jackson and Joseph Doyle are stationed aboard Track 7, an outpost monitoring the traffic in and out of the solar system. When Karl wakes up with his nose pressed against a metal plank, he soon realizes that the lack of gravity is only the beginning of his problems. Is gravity their only problem or is there more to it? 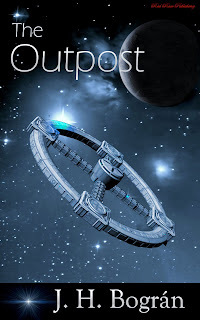 I just received the most wonderful news from my publisher: The Outpost will be released on Feb/28!!! Since I want you to know what the heck I'm talking about, here's a small excerpt and coverart for your ease ref. “Joe, my space suit is not working properly. I'm getting dizzy. Which is the fastest way to the door?” said Karl into his radio. Karl followed his partner’s direction but found himself facing the rear of a thruster. He saw a gleam of pure white light growing into a flame right in the center of the hollow exhaust. An invisible forced pressed his chest hurling him away from the station. Confused and dizzy, he tried desperately to grab one of the handles but he was a millisecond too late: the station was whirling away! Love Me Two Times - Red Rose Publishing Available Now! Absolution Withheld - Amazon Short Available now! As a movie fan, I cannot watch a show like the “Oscars” and have nothing to say about it. Being the 80th uninterrupted annual ceremony I can understand, an agree, that a little celebration and more homage than average is in order. I think the host did a good job, a bit on the cruel side of jokes, but funny nonetheless. I was surprised to see they gave a chance to the lady in the duet who had won for best song. Was it something to do with the host calling him names right after his acceptance speech? I can’t locate any gossip blog about it (a little help in the comments section would be appreciated). Other movie that I was surprised to see receiving lots of nominations was “The Bourne Ultimatum.” Very rare that 3rd sequels get so many. Okay, Return of the King is a special case of its own. What I mean is, did Rocky III, or Saw III, or Indiana Jones and the Last Crusade, or The Godfather 3 got these many nominations? Way to go for the Cohen brothers! But they looked out of words by the time to got the 3rd Oscar, don’t you think? I loved the way Cameron Diaz couldn’t say ¨Cinematography¨ but was able to charm her way out of it with her smile! How much would Nintendo Wii have paid to be quite possibly the best joke of the evening? That is subliminal advertisement at its best! As many of you know, I live in San Pedro Sula, Honduras. Although the picture right next to these lines is not from my home city, it is a landscape of the country’s capital Tegucigalpa. Still, I think the view is breathtaking. I visited there last weekend to attend a family engagement. The four hour drive was hard on the kids but they all enjoyed the green mountainous scenery, well, truth be told 2 of 3 fell asleep after the first hour. Only Capital City in the world that does not have a railroad system. It seemed to me like a $1,000 question, mostly because I didn’t know the answer, or at least I thought I didn’t. I will not go into the details of the sordid story behind the reasons of why we don’t have a rail road but it gave enough material for a 400-page book published back in the 90´s. It was not the original Honduras’ capital but the legend tales it became so 1880 on account of some high-society gossiping about the then-President Marco Aurelio Soto´s wife in the former capital city Comayagua. It is amazing all the things we men do for our women! Hope Mrs. Soto thought it was romantic! The publisher who's signed up "Love Me Two Times" has begun a new contest that is to run until Dec.
Everyone who buys 4 books or more, at one time, is entered to win a pair of black and white diamond earrings! Merlin Castell is not only a fellow Honduran, but I also had the opportunity to meet him, so I’m happy for his triumphs. LOS ANGELES, CA – DESIGNER MERLIN CASTELL IS BEST KNOWN FOR HIS HAUTE COUTURE TAILORED FITTED JACKETS, CRAFTED FROM HIGHLY UNUSUAL FABRICATION. HIS PIECES ARE POPULAR WITH CELEBRITIES, MUSIC, FILM, AND TELEVISION FOLKS, TRENDSETTER'S.THE MERLIN CASTELL LINE HAS A HIGH HIP FACTOR RANKING. AND IS BECOMING ONE OF THE MOST TALKED ABOUT COLLECTIONS IN LOS ANGELES – RANGING IN PRICE FROM $150.00 - $1,000.00 TO HIS CUSTOM MADE AND COUTURE GARMENTS THAT CAN SELL FOR MORE THAN $10,000.00.HIS DESIGNEES HAS BEEN FEATURED ON SUCH PROGRAMS AS THE “THE INSIDER”, “WEALTH TV’S WHAT TO WEAR”TO NAME A FEW. ALSO MERLIN CASTELL HAS BEEN FEATURED IN BOTH NATIONAL AND REGIONAL PRINT SUCH AS “APPAREL NEWS”,“WWD”,“LOS VEGAS MAGAZINE”TO NAME A FEW. AND CELEBRITIES LIKE LENNY KRAVITZ, PARIS HILTON, THE INSIDERS VICTORIA RECANOAND MANY MORE. THE ULTRA HIP DESIGNER WAS RECENTLY VOTED “ONE OF THE TOP TEN TO WATCH OUT FOR" BY THE POOL TRADE SHOW.BORN IN HONDURAS, WITH AN INNATE AFFINITY FOR FASHION AND A KEEN EYE FOR STYLE, CASTELL NEVER DREAMED THAT HE WOULD BE SO FORTUNATE TO CRAFT A CARRIER OUT OF WHAT HE ENJOYS DOING THE MOST. "MY JOURNEY HAS BEEN VERY MAGICAL," SAYS CASTELL. HIS CASUAL BUMP INTO THE FASHION INDUSTRY WAS ALMOST NEVER PURSUED. THE YOUNGEST IN A FAMILY CONSISTING OF FOUR BOYS AND THREE GIRLS, CASTELL WAS ALWAYS CONSULTED FOR HIS NOD OF APPROVAL WHEN IT CAME TO FASHION. "ONE OF MY EARLIEST FASHION MEMORIES IS ONE OF ME DRESSING MY MOTHER. I THINK I WAS AROUND THE AGE OF EIGHT WHEN I STARTED TELLING HER WHAT SHE SHOULD AND SHOULDN'T WEAR," SMILES CASTELL.ODDLY ENOUGH, HE STARTED OFF AS AN ARCHITECTURE MAJOR IN COLLEGE AND WAS REDIRECTED BY AN INSTRUCTOR WHO REMINDED HIM TO APPLY HIS TALENTS TO ANOTHER CREATIVE FIELD. HE CHOOSES TO FOLLOW HIS PASSION. "I STUDIED FASHION IN MEXICO, FOR A SHORT PERIOD OF TIME. THERE MY TEACHER COMPARED ME TO FRIDA KHALO, SAYING MY STYLE WAS DIFFERENT AND SUGGESTED I FURTHER MY STUDIES IN ITALY." CASTELL SAYS. "MY SPECIALTY IN SCHOOL WAS WORKING WITH LEATHER, BUT THERE WAS A TIME WHEN I COULDN'T AFFORD LEATHER. SO I STARTED TO APPLY MY IDEAS TO FABRIC AND THAT BECAME A WHOLE NEW SENSATION. "BY THE END OF THE NINETY CASTELL HAD COMPLETED HIS STUDIES IN MILAN AND WAS PROVING TO BE A PRIME TALENT. HE MOVED TO LOS ANGELES AND LANDED A JOB AT HOT KISS. AFTER THERE HE WENT TO ULTRA HIP STORE RED BALLS WHERE HE WAS HEAD DESIGNER. WHILE THERE HE HAD THE CHANCE TO WORK WITH SUCH CELEBRITIES AS PAULA ABDUL, N'SYNCE, MARILYN MANSON AND MANY OTHERS. "I believe a true designer is one who can bring a new concept in design. One who believes what he does is innovative and risky but does it because it comes from inside the heart," Merlin Castell. I do own a couple of compilation CD’s that I put on when I want to hear something other than crickets in the dead of the night while I’m typing. No, the gentle tap of my keyboard is not soothing! Tonight I went to my first Jazz concert, the US Embassy sponsored “The Kelley Johnson Jazz Quartet” for a tour around Latin America. So what did I do upon my arrival back home? Right after kissing my wife I logged into Amazon and found “Music is the Magic” and “Make Someone happy”, which are now into my wish list. While enjoying the velvety voice of Kelley, I got to think about one particular thing about Jazz that I find interesting: it feels spontaneous, like it’s not rehearsed. I know it has to be considering the artists to be professionals, but the rhythm, the gentle swaying, the change in tone, tempo and live playing of actual instruments makes it a wonderful experience. Playback is not a choice with this guys (are you listening Milli Vanilly & Ashley Simpson?). So here I am now, just about to go into Wikipedia and try to learn about the history of Jazz. My puppy made it through the night! YES! He is still weak and won't be running after my kids for a while, but he is already eating and looking better. Than you very much to the people who expressed their concern either here or through emails. For those who don’t know, “wasabi” is a spice used on Japanese food. I had the opportunity to try it this past weekend and it has a very strong taste like hot peppers. So when my wife’s aunt, who happens to be married to a Japanese gentleman, presented us with a puppy named “Wasabi” my inquisitional mind started racing conjectures about the name and the reasoning for it. The lady’s response was final and fair: because just like the spice, the puppy will add flavor to your lives. Our dog had been poisoned! The questions that entered this author’s mind are endless, but a quick inspection of his retch showed pieces of leaves, roots, intermixed with his Purina and even bits of plastic, the remains of the toys he likes to tear apart. Right now, he is not his usual playful self, but keeps sleeping off and is very dehydrated. Me and my wife have just finished feed him some special serum to help him reestablish.